Kitsilano Beach Park and buildings in the West End and downtown Vancouver at sunset. Photographed from Kitsilano Beach Park in Vancouver, British Columbia, Canada. 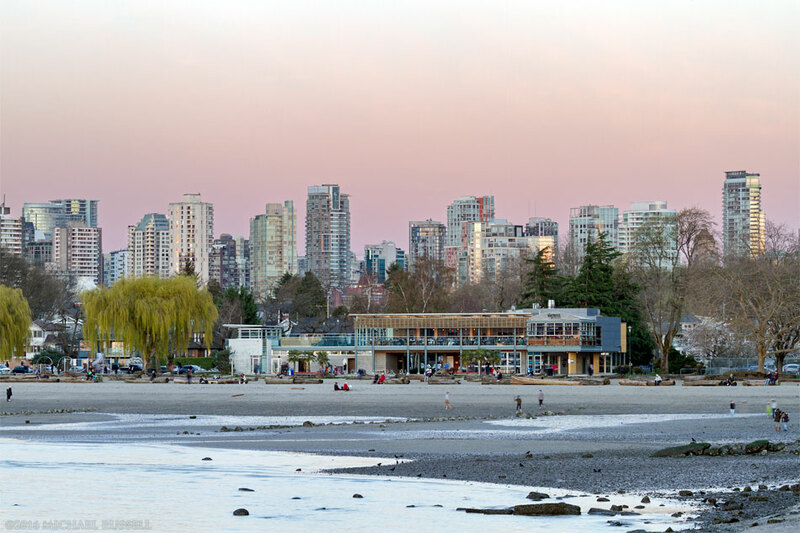 Earlier I shared some blue hour photos of similar scenes of Kitsilano Beach Park, Vancouver’s West End, and English Bay that I made back in March. The two photographs here were made about 20 minutes earlier when there were some sunset colours in the sky, and even a hint of Earth’s shadow (aka the Belt of Venus – top, right). This is the kind of sunset photograph I enjoy – the light from sunset in the sky, on the mountains and the buildings to the east. I was in Vancouver on this day due to the good weather and that we had just had some fresh snow on the Northshore Mountains – conditions that had eluded me the previous winter. The top photograph here includes Mount Seymour with some fresh snow above the buildings of the West End of Vancouver city. I think the two make a good combination. The second photograph here shows the Boathouse Restaurant at Kitsilano Beach Park during the night’s sunset. It had not yet become chilly at this point in the evening, so there were still quite a few tourists and locals on the beach. On a typical summer day (I shot this in March) I doubt you’d be able to see any sand around the beach goers from this vantage point – Kits is a rather popular beach during the summer. For more photographs of Cities and Buildings (mostly Vancouver) visit my Cities & Buildings Gallery.